Natural stone has always been regarded as a great choice for home design, be it marble, granite or quartzite. Yes, quartzite. Well, many of you might be thinking if it is actually a stone or just another upshot of advancements of stone engineering and technology! In case you are the one thinking so, then you can’t be blamed completely for that sheer lack of knowledge. Actually, quartzite stone is the most unsung hero of the natural stone world. You might have heard of the royal marble or the tough granite, and may be, have got either or both of these natural stones installed somewhere inside or outside your home, but rarely came across of something like ‘quartzite.’ As a matter of fact, the term ‘quartzite’ itself is not so popular, just like marble or granite, and usually kept underrated. Contrary to this, the fact is that this one natural stone from India is any day comparable to the other two, not only due to its enticing looks, but strength and durability too. Quartzite can definitely be your next choice for home designing if both looks and durability are your concern. It might come to you as a surprise, but this one stone as appealing as marble by appearance, and at the same time, stronger than granite. This might sound crazy as to how a single stone could possess the qualities of two most popular natural stones of the world! Let’s get to the bottom of these facts. Talking about its looks, you might be taken aback by the fact that most natural stone dealers sell quartzite in the name of marble! This might be a shocker, but this would certainly give you an idea of how much quartzite resembles with marble. Now, coming to strength, let the science speak! Mohs’ scale – the relative measure of mineral – will do the job here. Granite stands at 6, whereas quartzite scores 7 on Mohs scale, and greater the Mohs scale rating, more durable the stone is. So, unquestionably quartzite is stronger and more durable than granite. 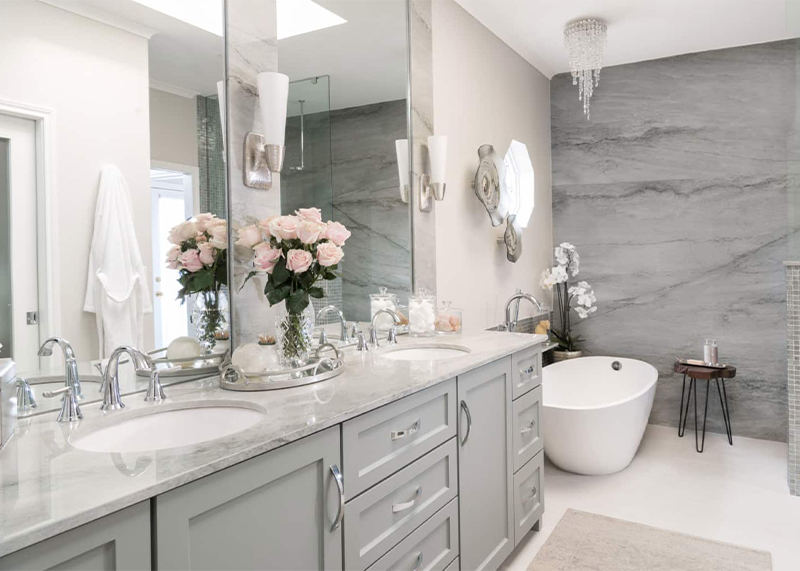 So now when you are aware of the positive sides of quartzite, it’s time to see how this natural stone from India can be creatively used in home design for an ultimate transformation. Let’s begin with flooring. 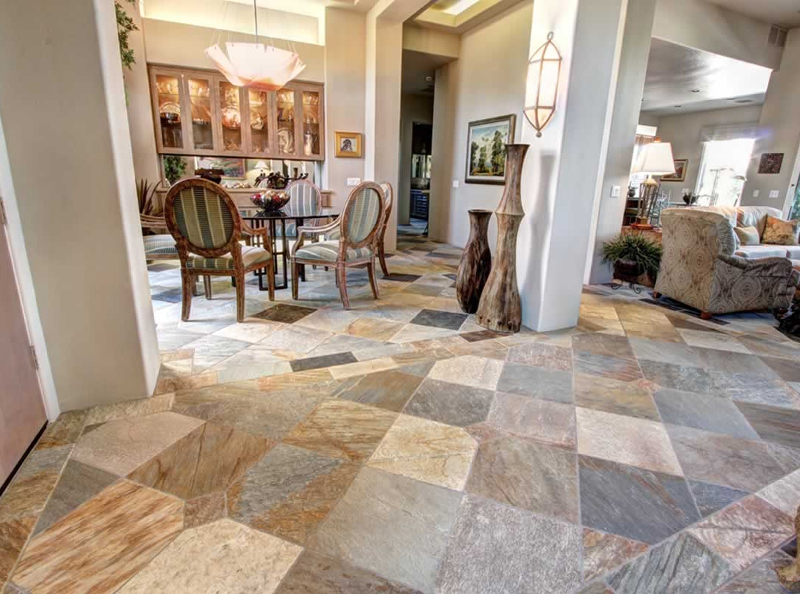 Quartzite flooring is one extensive application of this tough natural stone from India. It can be either used in a single shade or you can even go for two contrasting shades of quartzite too. Another popular interior application of quartzite is kitchen countertops along with vanity tops in bathrooms. Backsplash and kitchen islands are other kitchen-based stone installations for which, quartzite is a great material. With proper sealing, quartzite stone countertops performs really well in kitchens and bathrooms even if they frequently come in contact with acidic stuffs, oils, greasy substances, foods and many other fluids. 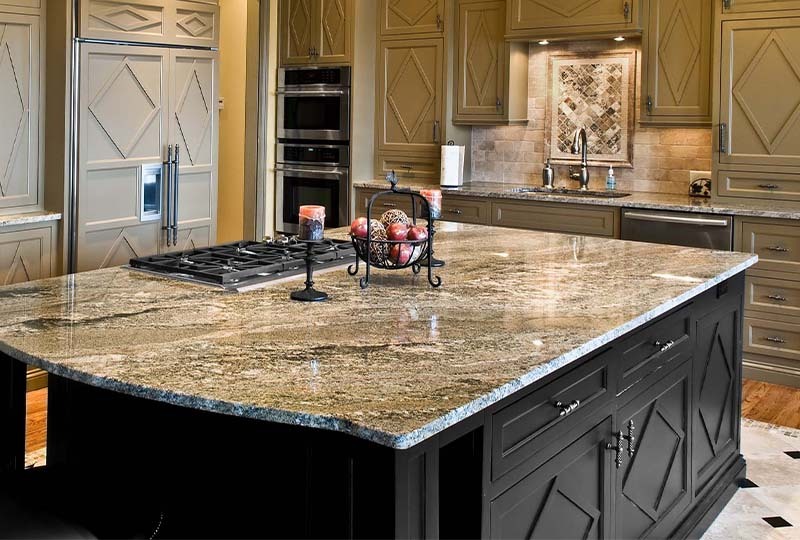 Sealing also makes the stone resistant to scratches and doesn’t allow the dirt to settle on the countertop. Quartzite naturally doesn’t support bacterial growth and this feature is further enhanced by sealing, ensuing longevity of the quartzite installation. LLikewise, wall cladding and bathtub surrounds are other preferred applications of quartzite inside homes. Quartzite is also profusely used to create fireplaces in gothic style or large residences. 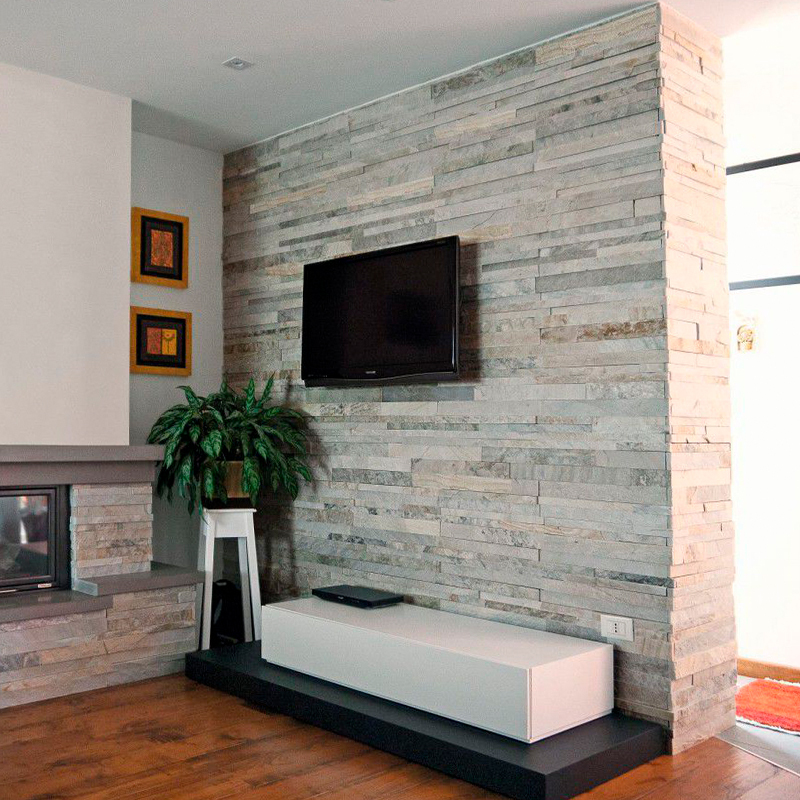 A relatively newer application is, however, feature wall, is gaining a lot of popularity these days and thankfully, quartzite has all the potential to be chosen as an ideal material for this wonderful installation. To conclude, it can be said that quartzite stone with its mesmerizing looks of marble and toughness of granite is just the perfect natural stone from India for your home contraction or the next renovation project. With little care and easy maintenance, it can definitely keep gracing your home interiors for many decades after its installation.